The cold days of winter have moved in with a vengeance this year. Winter can be a brutal time to spend outside looking for birds, but if you know where to go and what to look for, it can be an enjoyable adventure! 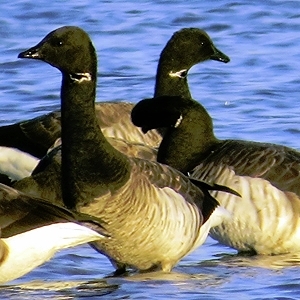 Waterfowl are in abundance across much of North America in winter. They are also looking for mates so are in their prime plumage, making for great sightings. As long as the bodies of water in your area are not completely frozen over, you are likely to find ducks near you! And when its really cold, sometimes you can watch them right from the car. The Bosque Del Apache National Wildlife Refuge in south-central New Mexico is an excellent place to see ducks in winter. The seasonal wetlands provide food and habitat for hundreds of thousands of ducks. You will find the greatest number of birds at the refuge from November through February. Pre-dawn and the early evening provide the best numbers of ducks coming and going from the water to forage and roost. There is an auto-driving loop and many trails to hike for a day of family fun with thousands of ducks of many varieties. Some ducks you may find there include Northern pintails, American wigeons, Canvasbacks and Hooded mergansers. Edwin B. Forsythe National Wildlife Refuge along the coast of New Jersey is an excellent place on the east coast to view dabbling ducks this month. The refuge is a winter retreat for thousands of American black ducks and Atlantic brant. In fact, forty-seven percent of North America’s black duck population winters in New Jersey. 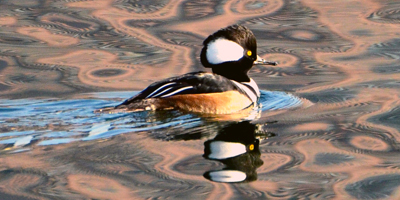 The wildlife driving tour provides excellent views of Bufflehead, Common goldeneye, Green-winged teal and Red-breasted mergansers. The back bay salt marshes are always filled with thousands of waterfowl to challenge and brush up identification skills. The White River National Wildlife Refuge in Arkansas boasts excellent numbers of wintering waterfowl. The refuge sits along the Mississippi Flyway and holds the largest concentration of wintering mallard ducks. The habitat here is a paradise for overwintering ducks. The beautiful, naturally flooded hardwood forests provide abundant food and habitat for ducks and other waterfowl. Thousands of Snow geese can also be found here in the winter. You may also have excellent views of Gadwalls, Wood ducks and White-fronted geese. Visiting a local national wildlife refuge is a great opportunity to see all kinds of birds throughout the year and is a great family trip as many of them allow you to drive through. Your kids will talk about these beautiful and easy-to-spot ducks for days, and waterfowl are a great way to get kids started learning birds. Another notable winter bird this year continues to be the Snowy owl. A massive irruption of Snowy owls is currently taking place along the eastern and Midwestern United States and Snowy owls are showing up on beaches and along open fields. If you have never seen these majestic birds, this is the year to do it! Learn more at Project Snowstorm. Rough-legged hawks are overwintering across the United States as well as the Dark-eyed junco, American tree sparrow and Tundra swan. Make sure to check out nearby field edges and hedgerows where wintering sparrows may be hopping around in abundance. Simply knowing where to look in January is a great start to a large year list. What can seem like a dull month for birding can provide excellent opportunities for rare birds to show up right in your backyard! Keep an eye out for overwintering birds that may be using the feeders and habitat in your region.